You are here: Home / Eat / Flourless Chocolate Cake Recipe That’s Gluten-free, Moist, and Tastes Amazing! 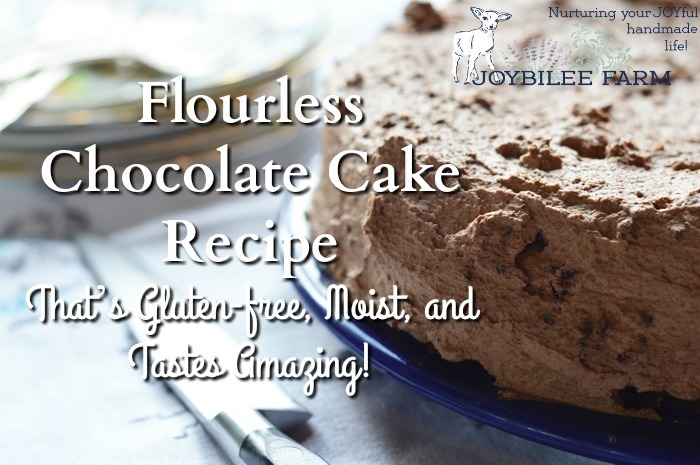 Flourless Chocolate Cake Recipe That’s Gluten-free, Moist, and Tastes Amazing! This flourless chocolate cake recipe is made with leftover, cooked, quinoa. It is light and structured with a texture like a normal cake. This is the ideal recipe for Passover celebrations, gluten free desserts, or for those following a grain-free diet. Make it tonight. What can you do when dinner guests, friends, or family members are “off wheat?” It might be because of a diagnosis of wheat allergy, perhaps because they are on a special diet, or maybe it’s just because Passover is at your house this year or you are bringing the dessert for a Passover potluck. Regardless, there is the issue of providing a happy dinnertime experience in a situation where a family member or a guest might feel deprived. 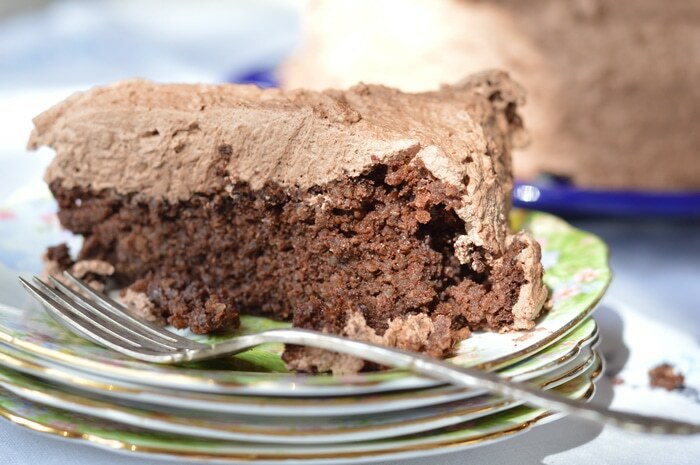 With this flourless chocolate cake recipe, you’ll be armed to provide an inclusive, satisfying dessert that really meets a craving, both that emotional satisfaction of feeling part of a celebration, and the mouth-watering satisfaction of a delicious, sweet, and sensuous chocolate cake. 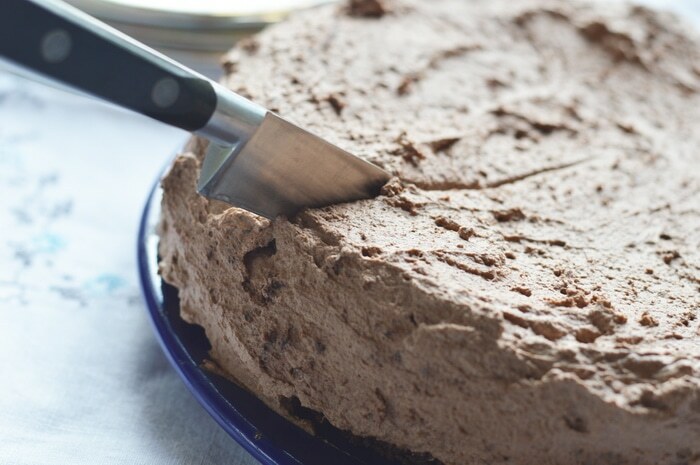 And if this is for a Passover celebration, with a little care in choosing the ingredients, you’ll have a most satisfying flourless chocolate cake that is suitable for Passover observance. Tips on this are at the bottom of this article. 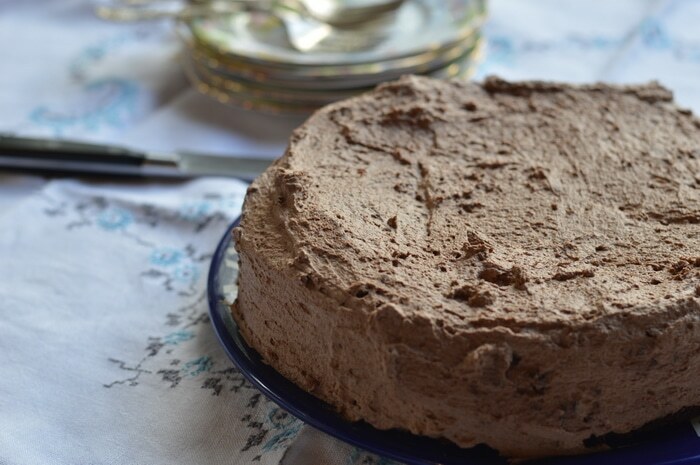 This chocolate cake is wheat-free, gluten-free, and can be kosher for Passover. It is the perfect, light, dessert for the end of a celebration meal. Make it as a 2 layer cake, by doubling the recipe and using two 9 inch pans, for a birthday or large gathering. The 2 layer cake will serve 12 comfortably. 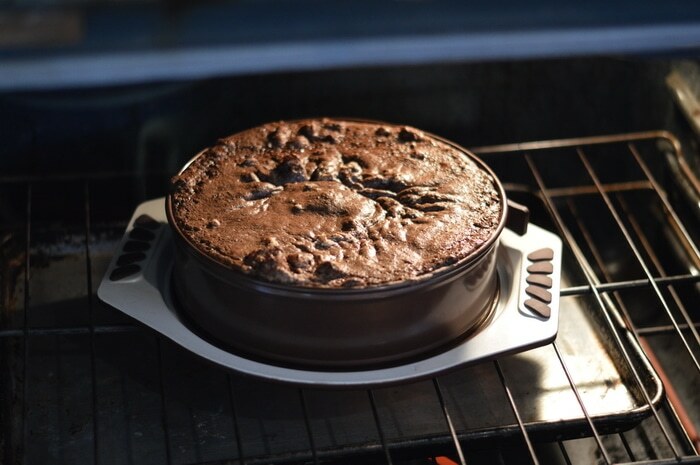 Make it in a single layer 9 inch cake pan and it will serve 6 for a week night meal. This recipe uses two cups of leftover quinoa. If you don’t have any one hand see this post with instructions on how to cook quinoa. *choose Kosher for Passover products if you are making this for Pesach and you wish the cake to be Kosher for Passover, otherwise proceed as usual. **Use a nondairy, pareve whipped topping if your flourless, chocolate cake will be served with a meat meal. Otherwise real whipped cream is best. Preheat the oven to 350°F. 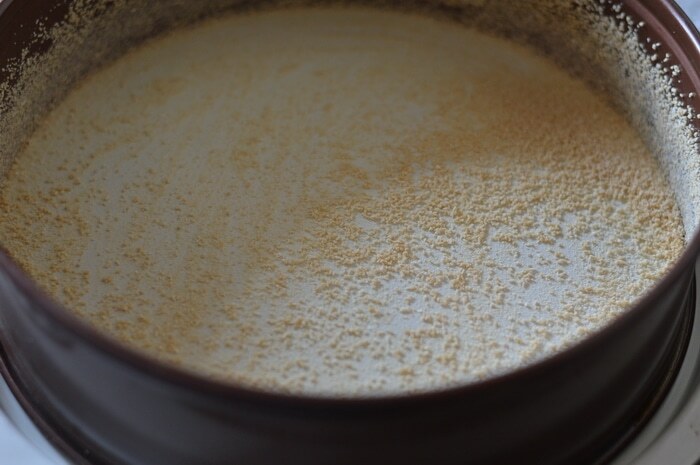 Butter a 9-inch round, non-stick cake pan and sprinkle maple sugar on the pan as a non-stick coating. You can use organic granulated sugar instead of maple sugar if that suits you. I like the maple glaze that using maple sugar gives. The sugar will melt and form a barrier between the pan and the cake, making the cake easier to remove from the pan. The maple sugar also gives the cake something to cling to as the cake rises, making for a loftier cake. Melt the butter. Separate the eggs placing the egg whites in a separate mixer bowl. 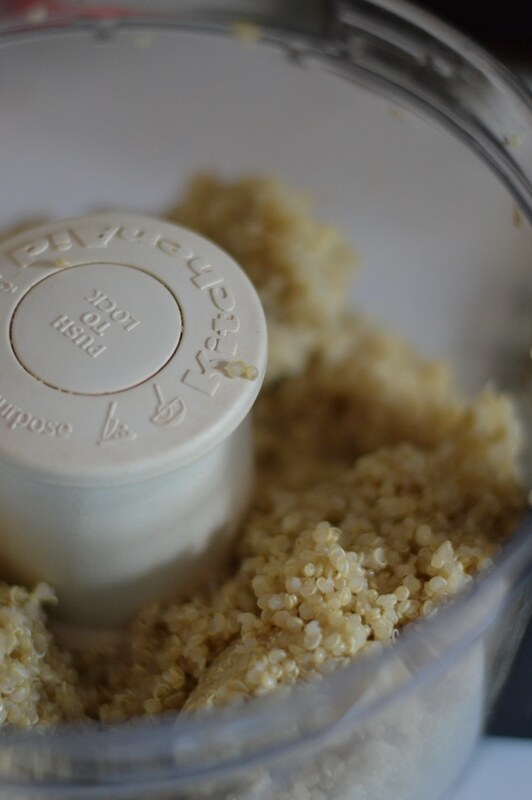 Put the quinoa, buttermilk, egg yolks, melted butter, and vanilla into the bowl of a food processor fitted with the metal blade. (This is the food processor I use.) Pulse to combine and then process until smooth, this will only take about a minute or two. If the quinoa isn’t combining, remove the lid and scrape down the sides of the bowl. And continue processing, in order to get the batter completely smooth. Add the sugar, 1/2 cup of the cocoa powder, baking powder, and salt to the bowl and pulse to combine well. Since there is no gluten in this recipe you don’t need to worry about over beating the batter. In a separate bowl whip the egg whites until stiff peaks form. Place the quinoa batter into the egg whites and gently fold together until the egg whites are fully incorporated into the batter. Don’t mix the egg whites too vigorously. You want to keep the air in the batter, that the whipped egg whites are providing. Turn the batter into the prepared pan. The batter will fill the pan to within one inch of the top of the pan. Place a baking sheet under the pan inside the oven to catch any overflow. Because this is a gluten-free cake it won’t rise to fill the pan in the same way that regular cakes do. Bake for about 40-45 minutes until a toothpick inserted into the center comes out clean, and the cake pulls away from the sides of the pan. Remove the cake from the oven and let it cool on a cooling rack, while still in the pan, for 15 minutes. Loosen the sides of the pan with a spatula. Place a plate over the top of the cake pan and gently invert the cake onto the plate. It should come off cleanly if you greased and sugared the pan. Allow the cake to cool completely on the plate, before icing. Place the whip cream in a mixer. Add the cocoa and maple syrup. Using the whisk beater attachment, beat until the whipped cream is fully whipped and stiff. Do not over beat. Spread the frosting over the sides and top of the fully cooled cake. Chill the cake until ready to server it. Will a flourless chocolate cake rise to the occasion? This flourless chocolate cake recipe is the bomb. It’s has the light texture of a normal cake without the gluten hit for those who have to avoid gluten. But not only that, it doesn’t have the heavy texture of cakes make with gluten-free flour, where guar gum or xanthan gum are added to replace the missing gluten. It does lack some of the loft of a normal cake but the texture remains light and fluffy. Just like you’d expect in a cake that was make with wheat flour. But this is a flourless chocolate cake recipe. It is important to both butter AND sugar the sides of the pan before pouring the batter into the pan. The sugar forms a glaze on the outside of the cake giving it some structure and support. It also gives the batter something to climb as the cake rises inside the oven. Without the sugar, the cake form isn’t as dependable. 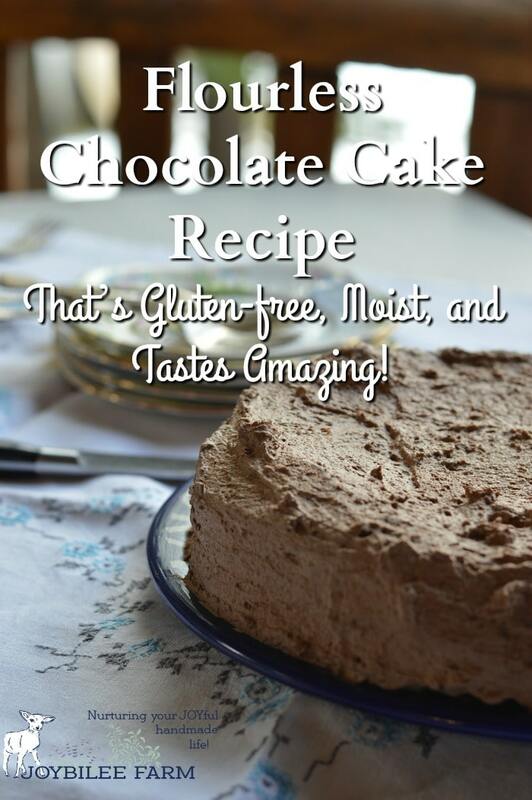 A quinoa based chocolate cake that is gluten free and amazing. Butter a 9-inch round, non-stick cake pan and sprinkle maple sugar on the pan as a non-stick coating. You can use organic granulated sugar instead of maple sugar if that suits you. I like the maple glaze that using maple sugar gives. The sugar will melt and form a barrier between the pan and the cake, making the cake easier to remove from the pan. The maple sugar also gives the cake something to cling to as the cake rises, making for a loftier cake. Separate the eggs placing the egg whites in a separate mixer bowl. Put the quinoa, buttermilk, egg yolks, melted butter, and vanilla into the bowl of a food processor fitted with the metal blade. Pulse to combine and then process until smooth, this will only take about a minute or two. If the quinoa isn’t combining, remove the lid and scrape down the sides of the bowl. And continue processing, in order to get the batter completely smooth. In a separate bowl whip the egg whites until stiff peaks form. Place the quinoa batter into the egg whites and gently fold together until the egg whites are fully incorporated into the batter. Don’t mix the egg whites too vigorously. You want to keep the air that the whipped egg whites are providing in the batter. Turn the batter into the prepared pan. The batter will fill the pan to within one inch of the top of the pan. Place a baking sheet under the pan inside the oven to catch any overflow. Because this is a gluten-free cake it won’t rise to fill the pan in the same way that regular cakes do. Bake for about 40-45 minutes until a toothpick inserted into the center comes out clean, and the cake pulls away from the sides of the pan. Remove the cake from the oven and let it cool on a cooling rack, while still in the pan, for 15 minutes. Loosen the sides of the pan with a spatula. Place a plate over the top of the cake pan and gently invert the cake onto the plate. It should come off cleanly if you greased and sugared the pan. Allow the cake to cool completely on the plate, before icing. Place the whip cream in a mixer. Add the cocoa and maple syrup. Using the whisk beater attachment, beat until the whipped cream is fully whipped and stiff. Spread the frosting over the sides and top of the fully cooled cake. Chill the cake until ready to server it. Is quinoa kosher for Passover? 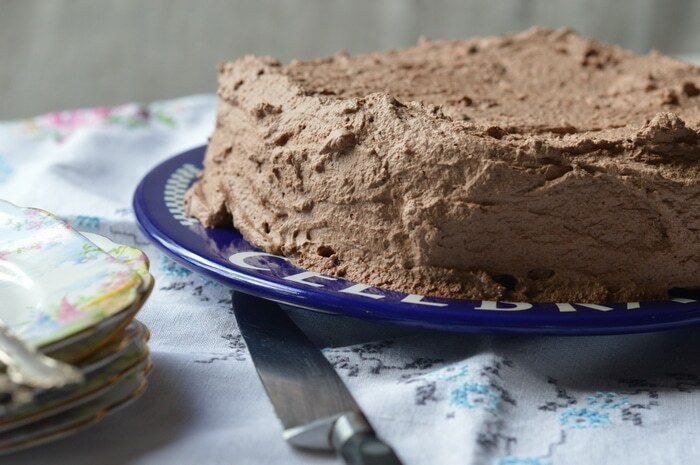 Whether you came here looking for a Passover dessert, or a flourless chocolate cake recipe to bake for someone who has gone gluten-free, I think you’ll want to save this recipe and add it to your repertoire of fabulous desserts. Bake one tonight. What’s a Nice Christian Girl Like You Doing Celebrating Passover?